Cozy, family-friendly, and eco-labeled, Daphne’s Club is conveniently situated just steps from the pretty beach of Sykia and the seaside pine forest of Xylokastro. Easily accessible by car, airplane, or train, it offers light and airy apartments for up to five persons, with free bicycles, Wi-Fi, and amazing baby amenities. So much more than a beach holiday, make the most of your holidays with outdoor activities, sightseeing, and workshops to suit each day’s mood. Daphne’s Club Hotel Apartments was created with the guests’ real comfort in mind. Everything is designed on a human scale, i.e. small, beautiful, and practical! The hotel has four floors (ground, first, second, and third) and one mezzanine. There is an elevator to the first, second, and third floors (the elevator does not service the mezzanine). In front of the hotel, there is a garden, and on the third floor, there is a roof garden with a splendid view of the sea and the surrounding mountains. On the ground floor are the reception, guest WCs (with baby changing station and disabled WC), a literature library with books in Greek, English, Dutch, German, Italian, French, and Russian, a small travel book library, a notice board with the area’s cultural events or excursion suggestions or public transport timetables, a recycling bin, a collection of games and cards for children and adults, a recreational corner for children and the breakfast room and cafeteria, equipped with TV and DVD, a piano, two guitars (classic and acoustic), percussions, and a children’s flute. In the garden, there is a children’s playground, tables and chairs where guests can also take their breakfast, a bicycle house with free bicycles for Daphne's Club's guests, and a luggage loading and unloading area. At Daphne’s Club you will find, without extra charge: wireless internet access, a Wi-Fi printer, beach umbrellas, beach chairs, yoga mats, nordic walking sticks, cards and other games, musical instruments, table tennis, tennis and beach rackets, reusable shopping bags, bicycles, excursion information, recycling bins, and much more. Beach towel is also available to rent for 1 EUR per day. This is a very pretty studio apartment on the first and second floor. It contains two single beds which can be transformed into one double bed, a sofa bed, a fully-equipped kitchen, a bathroom with bathtub, and a spacious private veranda overlooking the garden. The studio can accommodate up to three persons. This is a beautiful two-room apartment on the first floor. It contains a living room with two single beds sofa and a fully-equipped kitchen, a bedroom with two single beds which can be transformed into one double bed, a bathroom with bathtub and a private veranda overlooking the garden. This can accommodate up to four persons. This is a very spacious and comfortable 2-room suite on the mezzanine. It contains a living room with two single bed sofas and a fully-equipped kitchen, a bedroom with two single beds which can be transformed into one double bed, a bathroom with bathtub, a large private veranda overlooking the garden and a small veranda overlooking the small street at the entrance of the hotel. This can accommodate up to four persons. This is a spacious 3-room apartment on the ground and second floor. It contains a living room with one double bed sofa and a fully-equipped kitchen;two bedrooms with two single beds each, which can be transformed into one double bed; two bathrooms with shower (one en-suite); a private veranda overlooking the garden at the front of the hotel; and a small veranda at the back of the hotel. This can accommodate up to five persons. Daphne's Club Hotel Apartments is situated just a few steps from the beach, which is just fine for kite and windsurfing on windy days and three kilometers away from one of the best 16 kitesurf spots in Greece (as stated in the Greek kitesurfing community). Also, an hour’s drive away is one of the best - if not the best - kitesurfing spot in Greece, Akrotiri (Cape) Drepano in Rio. Daphne’s Club Hotel Apartments is situated in the small village of Sykia, two kilometers from the town of Xylokastro. The beach, where you can go swimming or sunbathing, lies less just a few steps from the hotel. Access to the beach is free. There are no umbrellas and beach chairs to rent, but at Daphne’s Club Hotel Apartments provides you with both! There are also beach toys for you to take to the beach, such as rackets, Frisbees, and inflatables. The beach is made up of small pebbles and the sea is of normal depth. The “Pefkias” seaside pine forest, which also starts practically at its doorstep, is a wonderful place to go walking, jogging, cycling, to take the stroller, or to meditate. It also provides much-needed shade from the summer sun and heat, so especially if you have children, it’s a good idea to sit under the pines instead of on the beach. Taking the path opposite the hotel you enter Sykia. Sykia is a small and picturesque village, with a few seafront tavernas, a church, a children’s playground, the remains of an Ottoman tower, and the early 20th-century villa of the famous poet Aggelos Sikelianos. At Xylokastro, you will find a wide choice of tavernas, bars, and clubs, as well as two open air cinemas (their daily programs are available in the reception area), a spa, the Tennis Club of Xylokastro, and a marina. The small town of Xylokastro, whose name means “wooden castle”, is a typical small Greek coastal town. Its 5,000 residents live off the land, cultivating citrus, olive and apple trees, as well as vines for the production of both wine and raisins. Culinary experiences are an important part of one’s overall travel experience. Daphne’s Club Hotel Apartments will introduce you to the best the area has to offer in this respect too! From accompanied visits to the weekly farmer’s market to thematic roof garden dinners, you will discover that Daphne’s Club is serious about the quality of food. Breakfast at Daphne’s Club, though optional, is one of the highlights of staying here. Forget those usual 7 to 9 a.m. breakfast times which always depress you because they mean that you have to choose between your much-needed sleep and your much-needed morning coffee. That is why the breakfast room is so nicely decorated, why you can have breakfast whatever time you wake up, why you are only served fresh homemade bread, that is why it has chosen to serve only Greek recipes (and have received the “Greek Breakfast” certification for this) and that is why as many breakfast products as possible are local and organic. There are a cafeteria and bar in the living room and garden. A specialty is a homemade lemonade and fresh smoothies! It also offers wine from selected winemakers in the wider area. Although all of the apartments feature fully-equipped kitchens, it is understandable that you might not really want to cook during your holidays. So, at the reception, you will be provided with the delivery menus of local restaurants. Farmers’ markets are among the highlights of everyday life in Greece, especially in the countryside. They are not just a venue for shopping fresh fruits and vegetables, but also a place to socialize. We enjoy farmers’ markets tremendously and this is why we offer to accompany you there for your shopping or just to see it. Follow the Athens - Korinthos highway to Korinthos, then the Korinthos - Patras highway. Follow the old national road backwards (Xylokastro - Athens). Sykia is the first village you will meet. Follow the hotel’s signs off the main road (left turn towards the beach). Follow the old national road to Patras. Sykia is the third village you will meet. Follow the hotel’s signs off the main road (right turn towards the beach). Leaving the airport, follow first the signs towards Athens, then the signs towards Elefsina. At Elefsina, the road you will be on links up to the aforementioned Athens-Korinthos highway, so from then on the above instructions apply. Follow the old national road from Patras to Korinthos. You will find Sykia right after Xylokastro. Follow the new highway from Patras to Korinthos. Follow the old national road towards Athens. The area is served mainly by the international airport of Athens and the airport of Araxos, near Patras. There is public transport available from the airport of Athens (bus and train) and you can also book a car or take a taxi, which can be arranged for you. From the airport of Araxos, there is unfortunately no convenient public transport, so you will need either to book a car or take a taxi, which can be arranged for you. Buses to and from Athens run every hour, roughly from 6:00 a.m. to 9:00 p.m. The bus stop is in Sykia, 50 meters from the hotel’s entrance. The bus costs approximately 12 EUR per person. From Athens, there is a new suburban train departing from the airport and bringing you to Kiato, which is 10 kilometers from Daphne’s Club. It runs roughly every hour. The train costs approximately 14 EUR per person. A taxi can be arranged to pick you up from there and bring you to the hotel (price between 15-25 EUR, depending on if it is pre-arranged or not). Trains to and from Patras run roughly from 6:00 a.m. to 10:00 p.m. The train station is in Xylokastro, from where you will be picked up. Please note that this line is currently being renovated and there is a bus instead of a train on this route. A taxi service can be arranged to pick you up at the airport of Athens or the port of Pireaus. The price for a taxi from the airport is approximately 180 EUR. A taxi service can be arranged to pick you up at the airport of Araxos or the port of Patras. 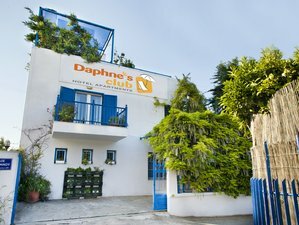 Daphne’s Club opened in 1996 as a family-owned small hotel apartment complex, created with their guests’ real comfort in mind - small, beautiful, and practical! This hotel is available from April to October, please select an arrival date below.